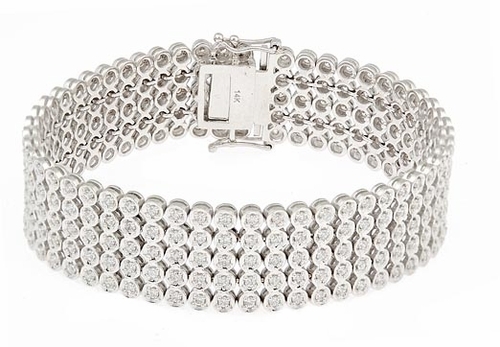 The Rio Quinto Bezel Set Round Cubic Zirconia Five Row Flexible Bracelet is a delightful accumulation of flexible glimmer and the over sized version of the original Rio Trio Bracelet. Each link features a round diamond quality cubic zirconia that is pin point set inside a concave bezel, with a total weight of approximately five carats of the finest hand cut and hand polished original Russian formula cubic zirconia. 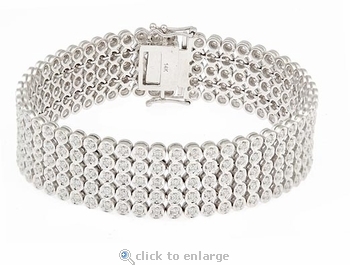 The five rows of the Rio Quinto cubic zirconia bracelet measures almost three quarters of an inch wide. This bracelet comes standard 7 inches in length and an 8 inch upgrade is offered in addition to 14k white gold, 14k yellow gold or luxurious platinum. Please see the pull down menu for options. For further assistance, please contact us directly at 1-866-942-6663 or visit us via live chat and speak with a knowledgeable representative.